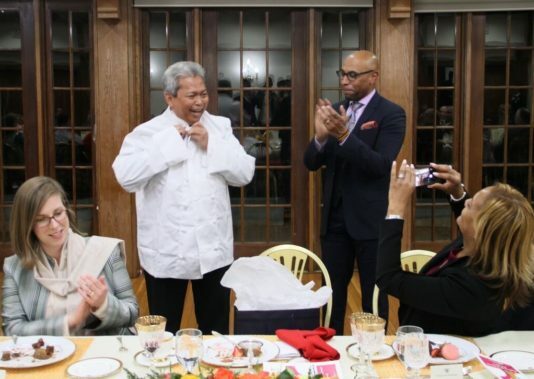 Food from around the world was gloriously served last week during a night of fine dining for 30 select journalists and diplomats at the private Washington, DC residence of H.E. 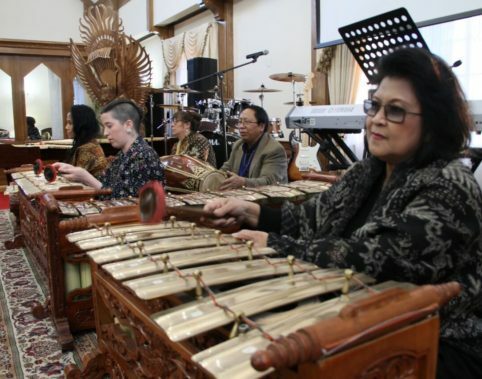 Budi Bowoleksono, The Ambassador of Indonesia and Mrs. Reshanty Bowoleksono. 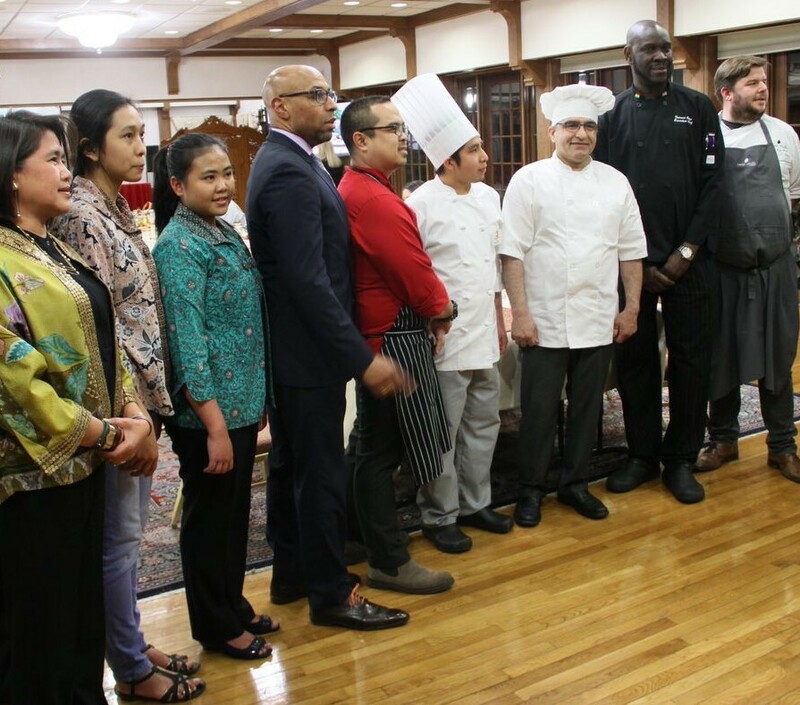 It was an exotic night of delicious food, in which the cuisine representing five countries was featured and served by a formally attired staff of men and women, who unobtrusively attended to the specific culinary needs of each guest. Mrs. Lael Harmon Adams Mohib, wife of Afghanistan Ambassador; HE Budi Bowoleksono, Ambassador of Indonesia; Erik A. Dyson, Sr., VP Events DC (standing after presenting to the ambassador, as a gift, a chef’s apron); and Chinyere Hubbard, VP, Events DC, (taking photos!). While the guests chatted and became acquainted over hors d’oeuvres and drinks, the direction of their conversation would suddenly take a turn as they sampled with delight the pleasantly unfamiliar taste of what they were served. To heighten the anticipation of each course to come, in the background a Javanese gamelan softly played, a video provided scenes from a banquet, not unlike what was unfolding that evening, of happy guests enjoying spectacularly delicious-looking food. 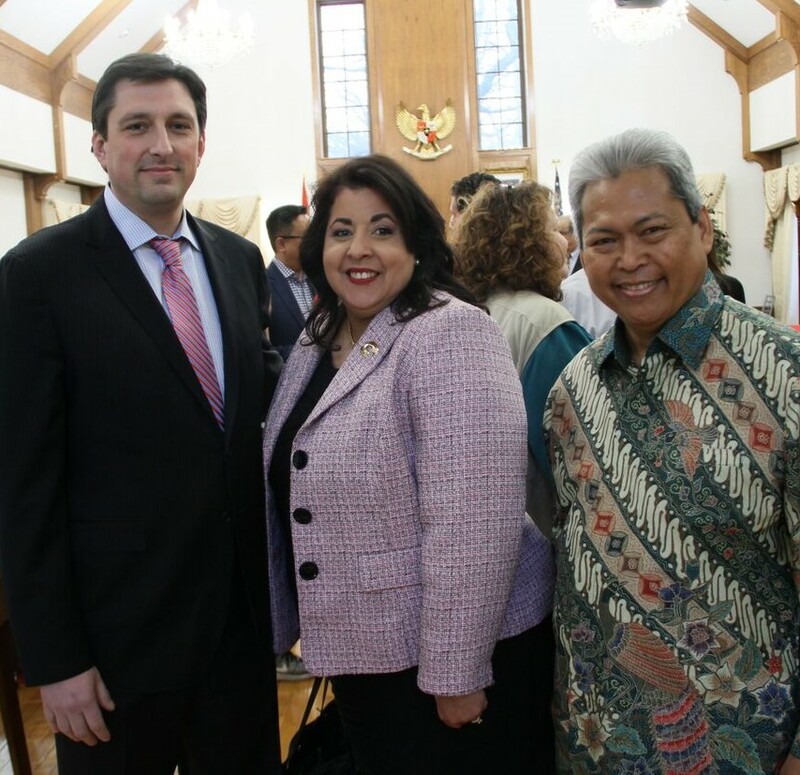 Andrew Gelfuso, VP, TCMA/RRB/ITC; Allyson McKithen, Sr. Operations Manager, RRB/ITC; and HE Budi Bowoleksono, Ambassador of Indonesia. To introduce each course, the chef responsible for the creation delivered a brief comment on his specialty for the evening. Working in concert with the other chefs, each chef made certain that his course suitably complemented the other courses. 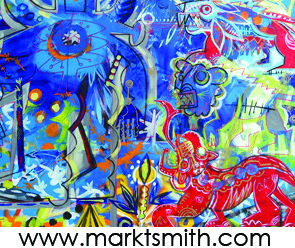 The result was a sumptuous continuation of food, sufficient, but not abundant, correctly and tastefully featured. It was an extravagant announcement of what was to come in May at the 9h Annual Events DC Embassy Chef Challenge, to be held at the Ronald Reagan and International Trade Center. 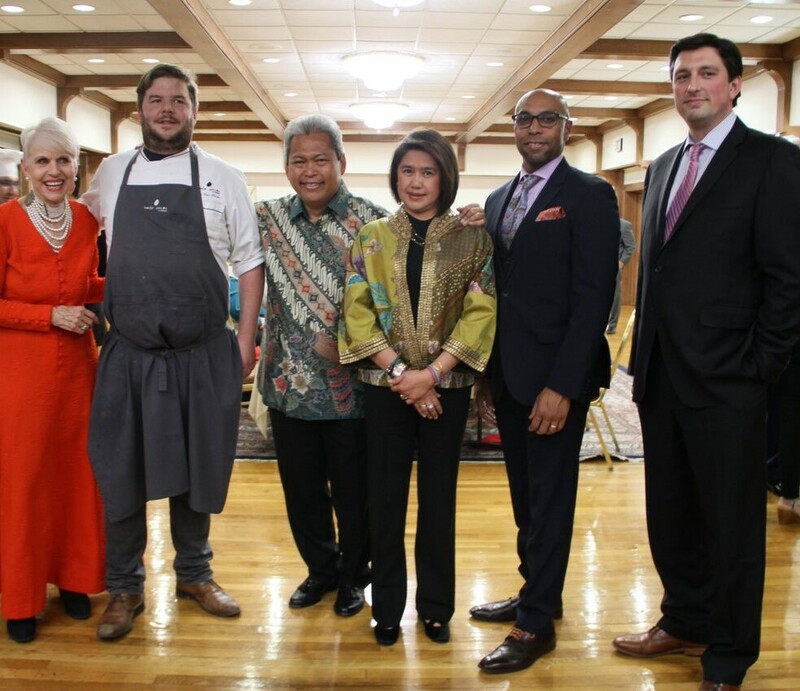 Mrs. Reshanty Bowoleksono, wife of Ambassador of Indonesia; Chef Kuntobaskoro’s two assistants, Dewiyanti and Sulastri; Erik A. Moses, Sr. VP Events DC; Chef Galih Kuntobaskoro, Embassy of Indonesia; Chef Elmer Gutíerrez, Embassy of Peru; Chef Mr. Samad Noori , Embassy of Afghanistan; Chef Francis Otoo, Embassy of Ghana; and Chef Jan Van Haute, Embassy of Belgium. 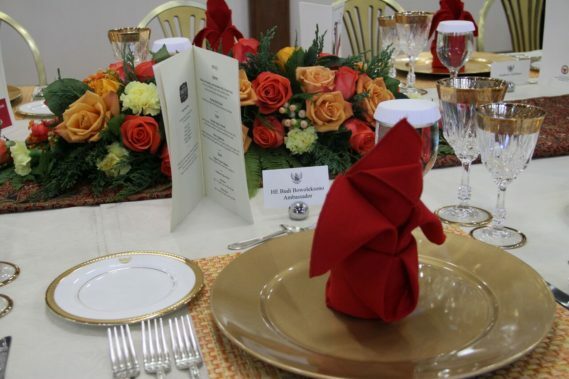 The formal dinner, privately promoting this year’s Embassy Chef Challenge, is a little different than what will occur in May for the public. Instead of being a sit-down dinner for 30 with food representing five around-the-world countries, it will instead be enlarged to include 2,000 ticketed guests who will be able to sample the entertainment, spirits, and the food from over 25 countries, prepared and served by their chefs and staff. Erik A. Moses, Sr. VP Events DC; Jan Du Plain, Embassy Liaison; Mrs. Reshanty Bowoleksono, wife of Ambassador of Indonesia; and HE Budi Bowoleksono, Ambassador of Indonesia. Embassy Chef Challenge, which is a signature event of Events DC during Passport DC, sponsored the evening’s dinner at the ambassador’s home, along with Indonesia, Peru, Ghana, Afghanistan and Belgium which graciously provided their chefs for the occasion. 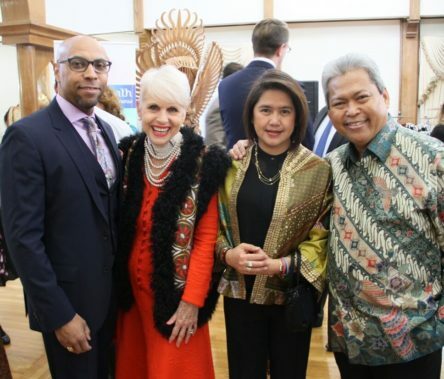 Among the embassy diplomats in attendance were; Mrs. Lael Harmon Adams Hohib, wife of Ambassador of Afghanistan; Agustín de Madalengoita, Deputy Chief of Mission, Embassy of Peru; Malena de Madalengoita, DCM spouse, Embassy of Peru; Mr. E.B. Asare-Asiedu, Chargé d’Affaires, ad interim, Embassy of Ghana; Mrs. Akosua D. Okyere-Badoo, Minister, Embassy of Ghana and Majeed Qarar, Cultural Attaché of Afghanistan. 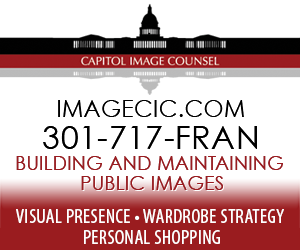 Special guests included Mr. Andrew Gelfuso, Vice President, TCMA, Ronald Reagan Building & International Trade Center and Ms. Allyson McKithen, Sr. Operation Manager, Ronald Reagan Building & International Trade Center. 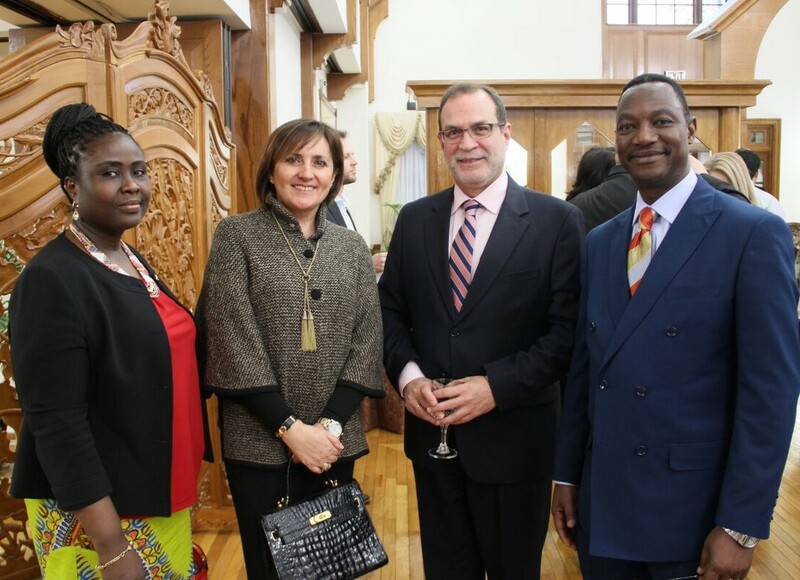 Mrs. Akosua D. Okyere-Badoo, Minister, Embassy of Ghana; Malena de Madalengoitia, DCM spouse, Embassy of Peru; Agustín de Madalengoitia, Deputy Chief of Mission, Embassy of Peru; and Mr. E-B. Asare-Asiedu, Chargé d’Affaires, ad interim, Embassy of Ghana. Among the media in attendance were reporters from Voice of America, Washington Life Magazine, WTOP Radio, NPR Radio and CNN to name a few. Some of the embassies to be represented at the 9th Annual Embassy Chef Challenge in May and compete for the People’s Choice and the Judges’ Choice awards are: Afghanistan, Bahamas, Bangladesh, Barbados, Belgium, Bolivia, Chile, Germany, Ghana, Haiti, Honduras, Iraq, Indonesia, Jamaica, Kenya, Pakistan, Paraguay, Peru, Saudi Arabia, Singapore, Sri Lanka, Tunisia, and Uruguay.